Learn why it pays dividends to take time and effort to research and write customer case studies. If you don’t involve your customers in customer case studies, then your case studies end up devoid of the useful information needed to help prospective customers in their decision-making. Jargon the case study subject wouldn’t recognise is used to explain the problem. Without an understanding of the problem, the case study lacks a sense of urgency or suspense. Clearly, a marketing department cobbled together the customer quotes, thus rendering the quotes insincere. Cheesy quotes from a salesman fill the gap where the most compelling part of the case study, the results should be. Customer case studies take time to put together and approve. Moreover, you worry that customers won’t have time to devote to promoting your products. Give you plenty of statistics and quotes you can use across your website and other marketing efforts. So what can you do to create a compelling case study? What would hook people to read your customer case study? Instead of focusing on tired sales messages, is there a different way you can show how your service indeed benefited your customer? Set up an interview with your customer. Start with questions about your case study subject’s background. Follow up with questions about your customer’s challenge, journey, your solution and the results. Then tell the story in a logical flow. Be as specific as possible. To compel people to read your case studies, insert plenty of detail. And don’t forget to include a call to action in the case study footer. In short, customer case studies tell stories from your customer’s point of view. That’s what makes them persuasive. What’s more, you can use case studies to support every stage of your sales process. So don’t skimp on the detail. And don’t pad your case study with jargon. Take the time to properly research and write up your case study. Trust me; it’ll be worth the effort. If you would like help putting together case studies, then do get in touch. 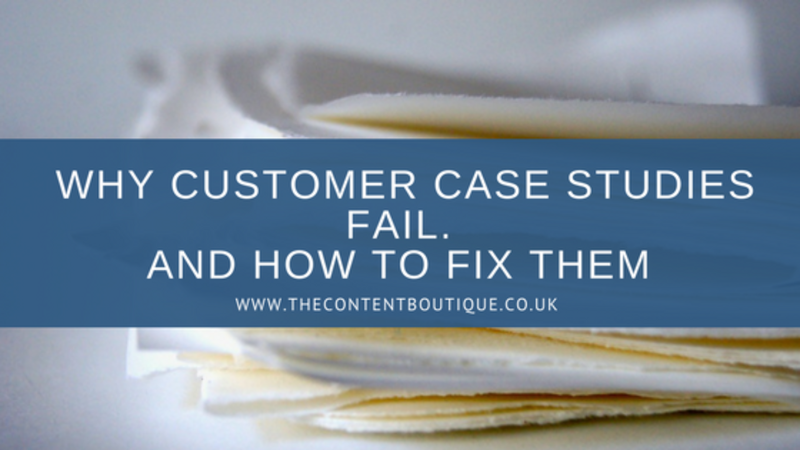 I have a tried and tested process that allows me to write compelling case studies, so you don’t have to.